We've had this kayak for two years and it was such a great purchase! We love that it can be single or double. the time to inflate/deflate is manageable and we love that we can just throw it in the car and go wherever we want. Quality inflatable kayak, fairly easy set up, stable, pure fun! Note that I purchased this product on Austin Kayak as it was not only the cheapest online but had a sale for 15% off all accessories with the Kayak. I highly recommend getting a pair of kayak PFD's. On top of free shipping, there is no sales tax if you are out of state - triple win. In the days where Amazon is king, its cool to see these guys as a big contender in the kayak world. The downside is that ACK uses FedEx and 2 our of 3 shipments from them have been late (No issue on ACK's part who have stellar customer service but how outright terrible Fedex is.) First thing I wanted to talk about is how beautiful this kayak is when inflated. It doesn't look like a cheap inflatable but a real product engineered for serious kayaking. I love it's intense orange color and how everything (but the kayak bag) seems so well thought-out and designed. I definitely feel that I am enjoying a product that took years to refine to its current iteration. I just completed my first 1.5 hour trip with this tandem kayak on a fairly still, large lake with a couple of other kayaks, sailboats, and the occasional speedboat. It was overall a pretty stellar, problem- free experience. Kayak setup was straight forward as I've set it up and took it down the previous day in my garage. I bought a double-action pump with a gauge and essentially just eyeballed the pressure of every part (I followed the PSI pressure guide the first time in my garage so understand generally how "stiff" all the parts should be.) I had no issues with buoyancy or tracking in the water. Attached are some pics from the trip! I am a beginner kayaker (only been a few times a few years ago) but plan on working my way up to doing some protected ocean- side trips. I purchased the backbone component but decided not to use it my first time just to see what its like without it. I would say if you are just going recreationally on calm lakes and calm waters, you will not miss out a lot by not having the backbone ' you go plenty fast and track and turn decently enough, though I'm sure with backbone support it would be even better (will update). The backbone does come with a lot of scary warnings to be more gentle with landings into sharp rocks or hard surfaces that the kayak without the backbone can do no problem. My girlfriend was initially afraid of getting in an "inflatable kayak" but we found the kayak so stable loading, paddling, and unloading, that even she quickly trusted the dependability of it. Our speed was surprisingly fast on the lake, not as fast as the expensive 20-ft single-person kayaks we saw but way faster than my brother's inflatable boat with three-paddlers (pictured. Then again this product costs 4x more than his inflatable). I found I could even make decent speed with my partner on the front, not paddling. Recommendations: - Any bad reviews I ever see of this product on Amazon or ACK seem to due to lack of proper air pressure. You cannot use an electric pump to get you all the way, it just can't output as much PSI as you need. The Advanced Elements Double Action Inflatable Kayak Pump (or any other similar double action pump) will get you there quickly and easily. 10-15 mins setup as others have stated is about right. - As others say, the first time you pull this kayak out of the case remember how its folded. You want to fold it exactly the same way for problem-free pack up. Essentially you fold it in half length-wise (making the kayak thinner) then you fold each end a 3rd in, followed by a third more folding to fold it all the way. - The first time I put this kayak in its bag, like others, I had a hard time making it fit. Packing the kayak away the second time on the other hand was super problem free and I even had room to fit tons of accessories. The trick is to not only release the air out of all the inlets but 1) Use your pump to ensure ALL the air is out before packing up (most important) 2) Close the valves once the air is out to ensure none gets back (less important but still useful, I am still experimenting with this) - The bag as everyone says, is totally useable and useful but using the same material could have been constructed into a back pack or something else easier to carry. If you have to carry this kayak down the road to reach a launch point it may be useful to get a foldaway cart for the bag as you will need to make a trip back to your car anyways to put the pump and other stuff away. Now that I have one successful trip on this kayak I plan on getting the "Advanced Elements Rapid Up Sail" and eventually an "Advanced Elements Double Deck Conversion" for protected bay / ocean paddling. Will update this review with more trip experiences! Overall, I couldn't ask for a better portable kayak, another happy customer. Thanks Advanced Frame. Thanks ACK! We bought this kayak for our vacation at Lake Tahoe. I was impressed with it's size while in the storage bag. We were able to easily fit it in our skybox for the trip. It was very easy to pump up and get into the water, I do suggest a good double action pump. Everyone in the family used it over the week and had a great time. My wife and I took it on a 2 hr paddle out in deep water and it tracked well and was stable. I was really impressed with ACK and their customer service! We did not think we were going to get it on time for our trip and ACK worked to get it to us! The communication was great with calls every couple of days to let us know status. Excellent, get ready in 5 mins. We have had great fun with our AE kayaks. They solve the transportation and storage problems. They are durable. Contrary to the negative reviewer, the backs are quite comfortable; just adjust the straps correctly. 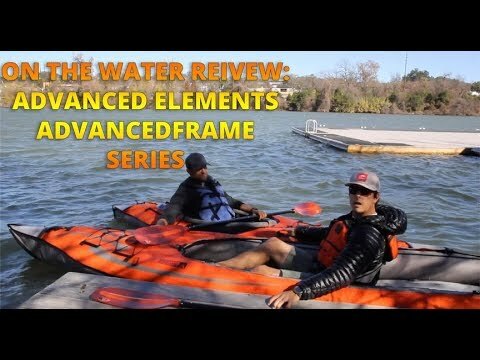 I made the mistake of purchasing one of the Advanced Elements AdvancedFrame convertible kayaks last year. My wife and I are experienced hard shell kayakers, typically doing 25-30 miles a weekend during the spring, summer and fall. Honestly, the Advanced Element kayak is one of the worst purchases I have ever made. I've had it out 3 times now and literally have not made it over 500 feet from the shoreline without turning back. The seat provides absolutely no back support, even though I have invested in the firmer, stiffer seat with the inflatable lumbar support. I find myself nearly laying backwards while trying to row. It's like constantly doing a situp in the kayak and it's the most uncomfortable and awkward activity. In my opinion, this is such a terrible piece of gear and so frustrating that I'm honestly not sure whether I want to dump it cheap on Craigslist or enjoy the satisfaction of slicing it to shreds with a box cutter. I am glad that I didn't start kayaking with an Advanced Elements inflatable or I would have never known how enjoyable this sport can be. Bought this kayak for my wife and I, and we love it! Took us about 30 minutes to set everything up the first time including double deck and backbone, but after a couple more trips, weve got this done to 20 minutes, and I expect we will get quicker. Extremely stable boat, tracks really well and find it quite comfortable Im 63 and 220lb. Took a brief paddle soloing from the rear seat as well, and found it very easy to control. The double deck conversion does a great job reducing the amount of water in the boat. 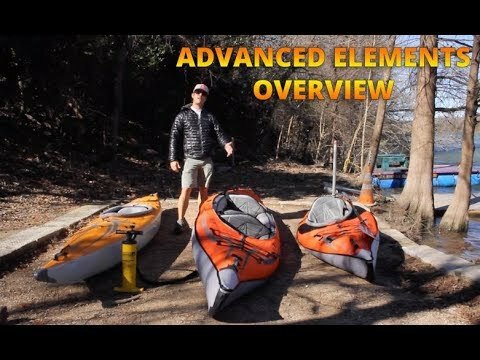 I purchased the Advanced Element after extensive research I live in a Hotel my job my partner lives in a condo, the kayak lives in the trunk of her car with the paddles life jackets pump etc. We get in the car drive to a lake or a river and in 20 minutes we are on the water, the stress is all gone, last week we saw 4 bald eagles flying over Cowan lake Cincinnati, then an Osprey. OK is it like a hard shell, No its an inflatable!, but its great for what i want I paddle it goes in that direction, tracking is good speed also, but it suits my purpose to a tee. We beach it and 15 minutes later its back in the trunk and we are off , usually to a restaurant to eat, being outdoors sure makes me hungry. OK I know dry it out but at the moment we Kayak twice a week, and so far its not been a problem. I did get the deck, saves getting wet it makes it a bit tight getting in and out but everything comes at a cost. Pumping it to the right pressure is a learning curve, but I am happy with my purchase, trouble is I am going to end up pimping it out I know lol. The rail system , waterproof video camera, high backed lumber seats, backbone, oh dont forget the cargo deck bag, foot brace, kayak cart then the spray skirt for the winter. I wouldnt change it for the world, OK a different colour would be nice its a bit like a kayak from a jail!! I have had this Kayak since summer 2009 and i love it. Its tough, i have hit plenty of rocks and rubbbed up against plenty of rough/sharp surfaces and this kayak could care less. Inflating take about 10-15 mins if you space off like i do. I use a double pump to pump it up, gives my shoulders a nice warm up. Its heavy, weighing in around 56 pounds i believe. It is comfortable to ride around for hours in this thing, it can be converted easily into a single user, but here is where a small problem starts. Its easier to kayak with your feet braced against something, and if you are sitting in the back you got something to brace your feet against, no problems; but if you sit in the front or convert this into a single seat kayak, you will have problems because you will have nothing to brace your feet against. You will need to buy the separate footbrace available on this site for $59, trust me, I have had this Kayak for 4 summers now. I am 6 foot. The seats are fine, but at times i wish they were more comfortable. I hope i have been able to provide what other reviews are missing. I didnt want to repeat others, so this is an alternative. Bottom line, I love this Kayak. Love this kayak! Since purchasing it a month ago, my son and I have taken it out to the lake every weekend and even gone fishing from it. It is definitely worth getting the optional backbone...tracking is noticeably better. The complaints are few. It could use a footrest in the front (but got around that by putting a dry bag there instead) and water does accumulate on rough days in the bow and stern holders where the aluminum ribs are (which requires drying it out with a towel to avoid mold problems and probably not too big a problem if you have the optional deck/skirt)....but you can't beat the portability factor as others have mentioned. We bought this boat last July and have enjoyed it since. I am 6' 230# my wife is 5'0" and we have plenty of room. Inflation is always under 20:00 with a 4-d battery Coleman and 2-way floor pump(I forget the brand). The later tightens up the creases and gives almost a hard shell feel to the craft. Easy to carry to lake shores from campsites and launches steadily. Feels very stable and tracks surprisingly well. A pair of two-piece Aqua-Bound paddles, about $150.00 each and decent PFD's and we're on the water. 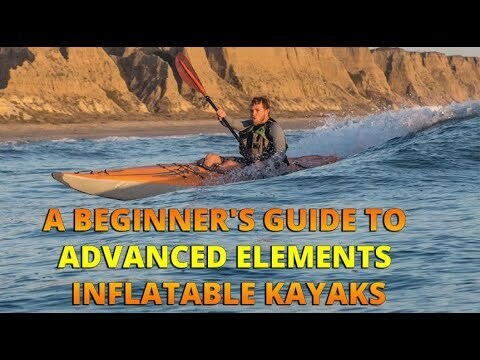 Excellent intro to the sport of kayaking for a more than reasonable price. I see no reason whay this gear would loose its value as a re-sale if I decided to go with a hard-shell. I bought my boat from a sporting goods store in Spokane Washington. The durability, quality and afordability of this tandem makes it a great choice for us novices. Highly recommended! This is a great alternative to a traditional hard shell kayak. Easy to set up, and takes up little space in the trunk, so you end up taking it more places. Very comfortable to paddle around in, and pretty efficient on the water. We have been on some pretty long trips in it and while it's not as sleek as a hard shell sea kayak, it' well worth it's price if you don't want to have to hassle with the roof rack and worry about some miscreant stealing your boat sitting on the roof. We liked it so much, we bought a second kayak and haven't taken out the hard shells in a year. Very tough construction and well built. We added the backbone and the decks which adds some efficiency at the cost of a little extra weight, but all in all, we would buy them again. Austin Kayak gave us a great deal and got us on the water fast. I have to tell you how delighted I've been with the service I received from Austin Kayak - and with the AE Convertible. I contacted the kayak manufacturers and they put me on to the people at A K who answered every query I had and shipped my order when I wanted it shipping to coincide with me being over in the US. I have only tried out this model as a single-seater (and with the backbone) but it handled really well, was extremely stable and cut through the water with ease. I had an initial hitch with the tracking but this was down to my not getting the backbone centred and as soon as I did things were fine. I'd been concerned that due to my height and size I might find the seating a bit uncomfortable but I spent several hours paddling up and down the coast and didn't have any trouble at all. The AE 1007 performed every bit as well as I hoped it would - and I have to say that everything I read about it in other reviews rang true. So, five stars for the Advanced Elements company and five stars for Austin Kayak. Absolutely love these kayaks. We bought 2 of them to use during our time living in Crete. Have had them out a couple of times so far and have absolutely no complaints. I had originally wanted a hard-shell boat, but a little more difficult and lots more $$ to ship overseas. I did a bit of research and decided on these kayaks from AdvancedFrame. I am very glad I did. They track well and are easy to get in and out of when snorkeling. Fantastic boats! We own two of the AF Convertible kayaks and two AF 10.5's. We love them all. We kayak along the coastline of the Caribbean Sea of the Dominican Republic. I have the optional backbone for both of our Convertibles and have not paddled them without the backbone. This kayak is comfortable for two people and tracks extremely well. I also paddle it solo. I have paddled solo with a total of about 500 pounds weight in the kayak, and didn't have any trouble. It will handle large swells well, and tracks fairly straight in windy conditions. I highly recommend this kayak for durability and versatility. I have two things for you to consider about this kayak. One, it is heavy and difficult to move around without the help of someone else. Two, I don't like the stock seat. It just doesn't give my large frame the support I want. I had to purchase a high back seat for myself. All in all, a great kayak though. We just love our kayak we live in the mountains in Colorado not far from the Colorado River.We are still learning how to kayak but this is as much fun we have had (along w/skiing). Q: What does the kayak come with? Is the carrying case included? A: This does come with a carrying case. You will need to purchase the air pump separately. Q: So it comes with the double deck and the solo is bought separately? A: This kayak is convertible from a single to a tandem. Everything will be included with this. Q: does this have a multi-chamber inflatable hull? A: That is correct. The sides and the floor are two different sections.